Semi-natural grasslands can support diverse faunal and floral communities, including grassland birds, beneficial insects, and native wildflowers. Monitoring biodiversity of this type of ecosystem is important to assess abundance and richness of grassland-associated species, evaluate success of establishing grasslands, and to assess overall ecosystem health. We tested butterflies as surrogates for birds and plants to assess establishment success of semi-natural grassland buffers in north-central Mississippi using Spearman rank correlation (Spearman’s ρ). Disturbance and grassland butterfly guilds were generally not suitable surrogates for grassland bird metrics, non-grassland bird metrics, or nest density metrics. Butterflies did have consistent positive correlations with plant species richness and forb metrics, as well as consistent negative correlations with grass metrics, but these correlations were generally smaller than what is considered suitable to serve as surrogates. In general, butterflies were not suitable surrogates for birds or plants in semi-natural grassland buffers. 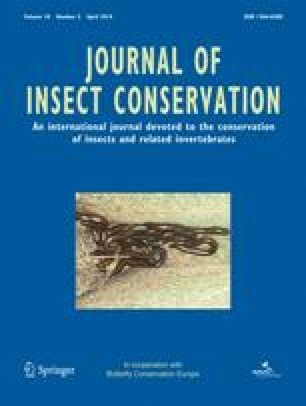 The online version of this article (doi: 10.1007/s10841-014-9626-8) contains supplementary material, which is available to authorized users. Our work would not have been possible without the cooperation of B. Bryan Farms and Prairie Wildlife, LLC. This research was funded by the USDA Natural Resources Conservation Service—Agricultural Wildlife Conservation Center (NRCS-AWCC). The Mississippi Agricultural and Forestry Experiment Station, the Forest and Wildlife Research Center and College of Forest Resources at Mississippi State University also provided support.